The cockroach is an insect that have been on the earth for hundreds of millions of years and mayeven pre-date the dinosaurs. Cockroaches continue to be one of the most populous creatures on this planet with over 3,500 different known species worldwide and about 450 species in Australia. There are cockroach species that live in both urban and rural areas. The one constant about cockroaches is that they are adaptable, capable of finding food and a way to survive even in some of the harshest environments. The hardy insects have survived global catastrophes and have managed to make homes in virtually every continent. Roaches also have adapted well when transported from their native lands to new regions. Cockroach Lifespan: Each species of cockroach has their own estimated lifespan but on average, cockroaches live between 100 days to one year. Factors such as food supply, habitat and climate affect lifespan. On average, cockroaches can live for a month without food but only a week without water. Cockroaches can feed on a variety of materials so starving cockroaches as a means of pest control is not effective. Cockroach Behaviour: This is what makes roaches particularly difficult antagonists for the pest control industry. Our technicians must constantly adapt and learn so that they can continue to find ways to eliminate and prevent cockroaches. Cockroaches have been clocked running up to 5klm an hour, which is very fast for an insect. Cockroaches are everywhere – an indication of their remarkable ability to adapt to all climates. Cockroaches prefer the night – which is why you usually see them when you turn on the lights at night. They prefer the darkness for finding food and mating purposes. Cockroaches reproduce fast – when you see one you will want to call in a professional. There are probably a lot more that you cannot see. Some female cockroaches will only mate once, but then spend the rest of their lives pregnant. Cockroach eggs are small and vary in colour, but most cockroaches are very good at hiding their eggs. You can end up with an infestation fast with many cockroach eggs. A cockroach will eat almost anything, but they prefer sweets, meat, and starches. However, you can also find them eating leather or books. Cockroaches hide – their bodies have adapted to squeezing into tiny crevices and cracks. Their ability to do this also means that even the smallest hole can allow cockroaches access to your building or property and once they are in there, they can be very hard to find. Some cockroaches can live for up to a month without food and for two weeks without water – there have even been cases where a cockroach without a head lived for a week. Roaches love to be in dark, warm areas – that’s why your home or building is so attractive to them. They want to be warm, have lots of places to hide and want to be close to food and water. Cockroaches move quickly and are often associated with dirty conditions. Cockroaches carry bacteria on their bodies from sewers, drains, garbage containers and other unhygienic areas then transmit these bacteria to humans by visiting kitchen and bathroom areas. Feeding in such unhygienic areas brings cockroaches in contact with disease organisms including salmonella and other organisms associated with dysentery, typhoid, hepatitis and tuberculosis. People can become allergic to cockroaches and their faeces. There is a strong association between cockroach allergens and asthma but cockroaches can also cause rhinitis and dermatitis. Cockroach Habitat: Cockroaches are everywhere – an indication of their remarkable ability to adapt to all climates. Cockroaches prefer the night – which is why you usually see them when you turn on the light. They prefer the darkness for finding food and mating purposes. Cockroach bodies have adapted to squeezing into tiny crevices and cracks which means that even the smallest hole can allow acockroach entry to your building or property. Cockroach Lifecycle: All cockroaches go through three stages of development – cockroach egg, nymph andadult. Eggs are hatched in casings called oothecae, where they develop and are protected from their environment. Once they hatch, they become nymphs and as nymphs, they grow in stages called molts until they become adults. Some species develop wings while others don’t. Cockroaches reproduce fast – when you see one, you should call Dominance Pest Controlas soon as possible. If you are seeing cockroaches out in the open, then there are probably a lot more infesting your property hidden from sight. Some female cockroaches will only mate once, but then spend the rest of their lives pregnant. What Do Cockroaches Eat?A cockroach will eat almost anything, but they prefer sweets, meat, and starches. However, you can also find them eating leather and paper material (books, newspaper, magazines). Cockroach Diseases: Cockroaches do not spend time cleaning up after themselves and they never wash their hands. That means roaches running around your kitchen counters are more than disturbing – the insects can bring a bunch of things into your home or business that you don’t want there. Things like disease and bacteria that can make people sick. Cockroaches love to infest garbage, decaying matter like food or even rotting flesh. They are also known to travel in sewers and other areas where they might encounter waste materials. A cockroach infestation can result in Illnesses such as food poisoning. Asthma and Allergies: For nearly 50 years now, experts have known that cockroaches are a major cause of asthma and allergies. The concern comes from their droppings, the skins that they shed and from the saliva they use to digest food. Cockroach skins and saliva release airborne particles that people can have an allergic reaction to (especially those who have asthma). 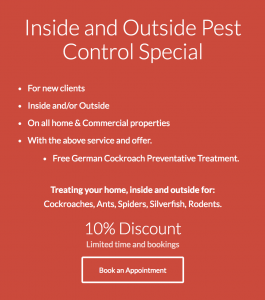 Best Way to Get Rid of Cockroaches: If you think you have a cockroach problem in your home or building, then contact Dominance Pest Control. Dominance Pest Control know how to find where the pests are getting into your home and we use environmentally sound pest control methods that focus on finding solutions that work and reduce the need for constant chemical treatments. How the service is carried out?With the interior of the home or commercial properties, a light spray is applied throughout the house / building along all the skirting boards. When treating the roof void and subfloor areas, our Technician will first inspect these areas and using an electrical pulsar apply the powder to all parts of the roof void and subfloor areas, (if applicable). External areas of the property are sprayed including all fence lines, perimeter of house, sheds, play equipment, clothesline, around garden areas, under eaves and around the windows. American cockroach: This cockroach is mostly found in moist, coastal areas, particularly in Queensland. Commonly found in drains, wall cavities and roof spaces. They are attracted to buildings by active lights during the night time. You will most likely find them in sewer systems, subfloors, grease traps, cellars, wall voids, roof voids, and in and around rubbish dumps. They will most likely habituate in restaurants, bakeries, hospitals and places where food preparation takes place. American cockroaches grow until 35-40mm in length. They’re a reddish brown colour with a pale-yellow border around their thorax (like their head). A female American cockroach will lay large egg capsules which mature in 6-12 months and live for another 6-12 months. Australian cockroach: Despite its name, the Australian cockroach is not native to Australia. The introduced pest species can be found mainly outside, but ventures indoors from time to time. They are attracted to lights at night and drains as they are nocturnal. At their full length, Australian cockroaches can grow to 35mm in length and are very similar to the American cockroach. The differing feature is their slightly darker brown bodies and the pale areas on the fore-margins of the forewing. The development stage will last from 6-12 months and their adult lifespan will last from 4-8 months. Brown-banded cockroach: The brown-branded cockroach is found mainly in the coastal areas of Australia and is usually found indoors, particularly in offices, storerooms and hospitals. They don’t frequent kitchens as they prefer dry areas. You’ll most likely find them behind and inside furniture, around picture frames, light fittings, among stored and filed paper etc. They can fly when the weather is warm or when they are disturbed. The brown-banded cockroach remains relatively little, only growing to 12-15mm long. The adult cockroaches are pale brown in colours and live for 3-6 months. They don’t build up large populations. German cockroach: The most widespread pest cockroach in Australia, you will be able to find them in commercialkitchens, cafes, restaurants, homes and other food handling areas. They are the most rapid breeder and prefer areas that provide warmth, food and moisture. Most likely found in or near the motor assembly of refrigerators and under stoves, hot water systems and various other appliances. They are amber in colour and grow to around 12-15mm. In ideal conditions, the breed and maturation cycle only take 6 weeks, with an adult lifespan of 4 -6 months. Oriental cockroach: Oriental cockroaches are the only cockroach who prefers cool conditions, and they can be found in southern Australia. They can be found indoors and outdoors in either damp cellars, subfloors, around drains, inside walls, in and around equipment, under garden debris and in dumps. They mainly feed on decaying matter and grow to 2-25mm. Unlike other cockroaches, they do not fly, despite possession of wings. Smokey Brown cockroach: The smokey brown cockroach is found in the outdoors, in the coastal areas of Australia especially the east coast. You’ll most likely find this cockroach in plant nurseries. This cockroach prefers plant material as they feed on organic materials and breed in gardens. They can be found venturing indoors to garages, wall and roof voids, and subfloors, but they will most often be found around drains, in wood piles, and under garden mulch. At their full length, they can grow to 30mm and are a uniform dark brown to almost black. Both male and female are fully winged, and they fly in warm weather.